The countdown is on! We are only one week away from the official release date of Disney’s live action adaptation of Beauty and the Beast – are you as excited as we are? In honor of the release, we decided to put together a little history lesson on Disney and Beauty and the Beast. If you like this, be sure to check out our “Disney History” column, every other month in WDW Magazine! In 1740, Gabrielle-Suzanne Barbot de Villenueve wrote the first fairytale version of La Belle et la Bête. 200 years later, Walt Disney explored turning the story into an animated film like Cinderella and Sleeping Beauty. It wasn’t until 1991 that Beauty and the Beast landed in cinemas around the world, capturing the hearts of young and old with critical and commercial success as Walt Disney Animation’s 30th feature film. Walt Disney Studios struggled in the 1970s and 80s to produce films that turned a profit. In 1989 The Little Mermaid swam into theatres and sparked a Disney Renaissance through to 1999 – a period of greatly successful films anchored by The Little Mermaid, Beauty and the Beast, Aladdin, and The Lion King. Initially, the film was nothing like the one we know today. The original concept was abandoned for something warmer and more whimsical. The setting became charming 19th century France (Colmar in the Alsace region was the inspiration for Belle’s small Provencal town), splashy musical numbers were added, Gaston was created to provide the film with a true villain, and a magical spell was put on the castle to bring to life the enchanted objects that we love so well. Beauty and the Beast was a groundbreaking film. An unfinished preview was shown at the New York Film Festival a year before its theatrical release to rave reviews. For the first time, an animated film wasn’t just a kid’s movie – it was perfect for a romantic date night. It became the highest grossing animated film in history (though has since been surpassed). Beauty and the Beast holds the distinction of being the first animated film to ever be nominated for the Best Picture Academy Award. It was nominated for 6 Academy Awards (winning Best Original Song and Best Original Score), 4 Golden Globes (winning 3 including Best Picture Musical or Comedy), and 8 Grammy Awards (winning 5 including Best Pop Performance by a Group or Duo with Vocals). 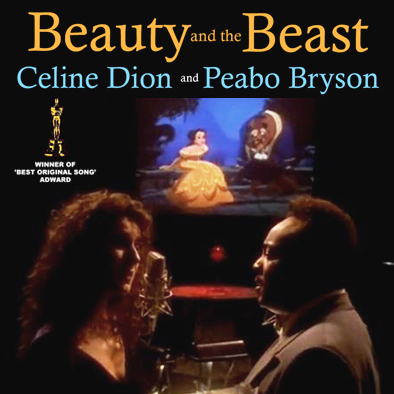 The pop version of the titular song Beauty and the Beast, performed by Celine Dion and Peabo Bryson, hit #3 on the Billboard Top 40 chart, and #2 in Canada. 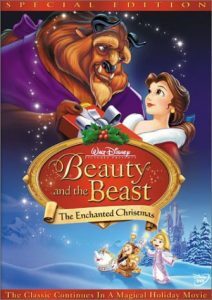 In 2002, Beauty and the Beast was inducted into the US National Film Registry, being deemed “culturally, historically, or aesthetically significant,” and it holds a place of recognition on 7 American Film Institution lists. 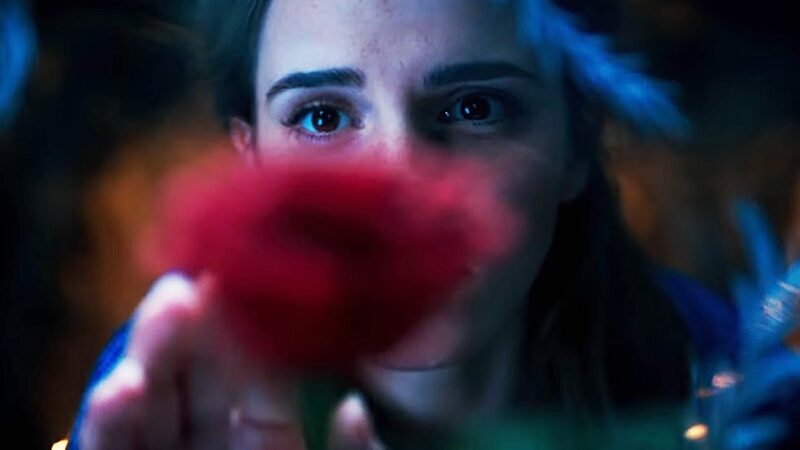 Beyond financial success, Beauty and the Beast was a technical trendsetter. It was the second film Disney used their Computer Animation Production System on – a program designed by Pixar to allow digital inking of hand drawn cells and automation of a depth effect without the need for a multi-plane camera. Notably, the ballroom scene relied most heavily on 3D camera effects made possible by the computerized system, and the success of that scene cemented Disney’s resolve to embrace the new animation technology – the path to modern computer animation had begun. The remarkable success of Beauty and the Beast has continued for 25 years. In 2000, the original film was re-released in theatres with the addition of a song cut from the original version, Human Again. In 2012, it was re-mastered in 3D and released once again in theatres. And in 2017, a new live-action version that marries a star-studded cast with state of the art CGI will be released. 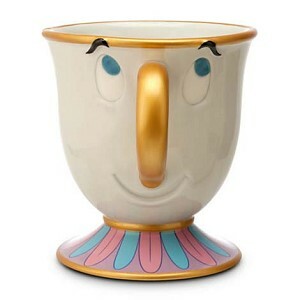 After the huge theatrical success of Beauty and the Beast, Disney began looking for new ways to bring the story to life. Modern musicals like Cats, Les Misérables and The Phantom of the Opera inspired Disney to create a live, on-stage version, which retained everything audiences had grown to love about the film, but with a unique look and feel – and a lot more music! Beauty and the Beast premiered on Broadway in 1994 at the El Capitan Theater. It combined music from the film with an expanded score and 6 original songs. The lavish sets and costumes brought together Rococo art and 18th century French styles. The character of the Beast was fleshed out in the stage adaptation – showing more of his internal struggle and sensitivity. 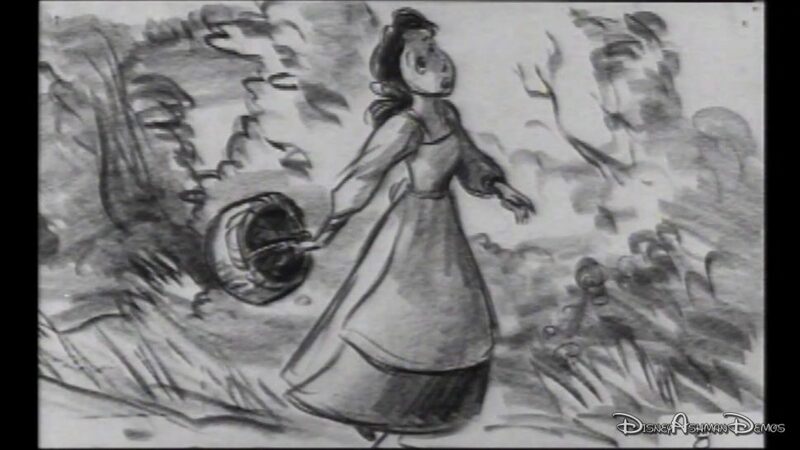 Belle also became stronger than in the film, with a darker sense of despair. The original cast was headlined by Susan Egan as Belle (who also voiced Megara for Disney’s Hercules in 1997) and Terrance Mann. From 1994-2007, Beauty and the Beast performed 5,461 times – the ninth longest Broadway run in history. In 1998, an additional song was added to the score – A Change in Me. It was written specifically for a 3 month run of the Broadway production that was to star Toni Braxon as Belle, and has been kept in the score ever since – although no English Language cast recordings have included it. 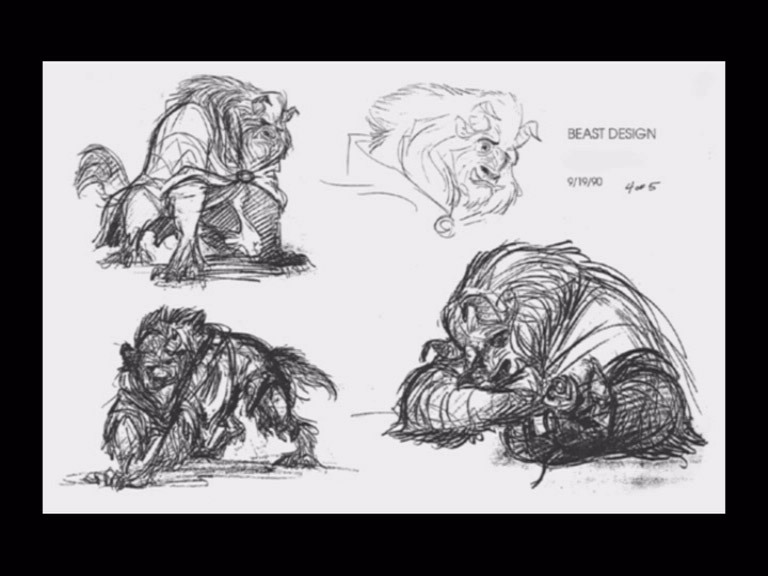 Beauty and the Beast took over 2 years to develop – most of that was time spent on getting the costumes right! Wigs, makeup, costume pieces, and prosthetics all made for challenging work, and lots of technical problems to overcome. The costumes for the show are extensive, heavy, and some require great physical stamina. 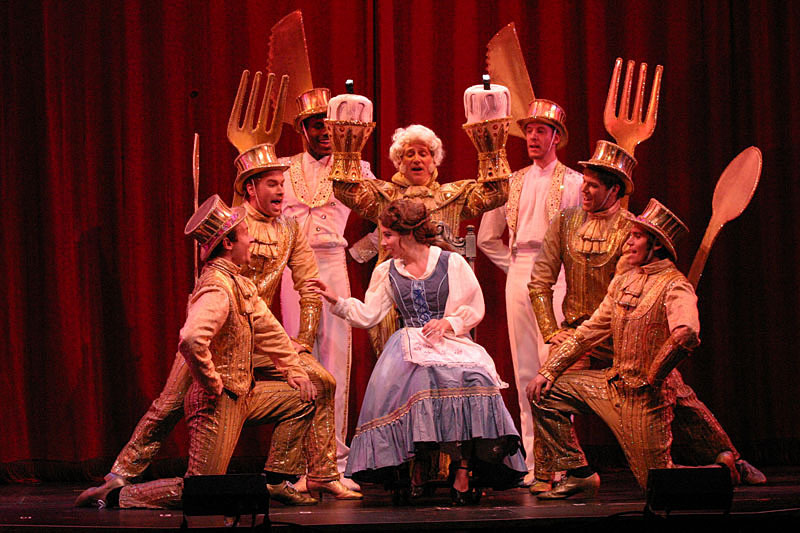 Lumiere’s costume took 40 people to build, and the honor of most expensive costume goes to Madame Le Grande Bouche. 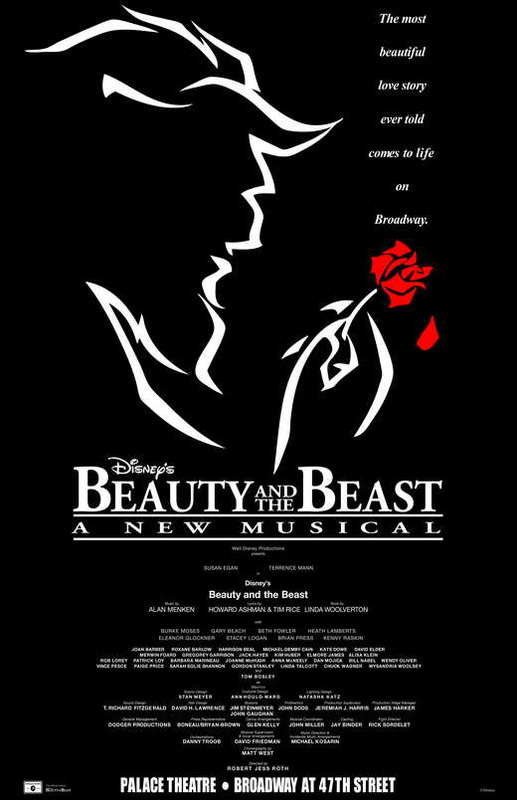 In 1994, the original Broadway production of Beauty and the Beast received 9 Tony Awards nominations (winning Best Costume Design) and 10 Drama Desk Award nominations. In 1998, the original London production was nominated for 3 Laurence Olivier Awards (winning Best New Musical). Beauty and the Beast has played in 13 counties and more than 100 cities worldwide, grossing over $1.4 billion. The West End run lasted from 1997-1999, and countless national tours, international productions, amateur productions, and junior productions have been staged. 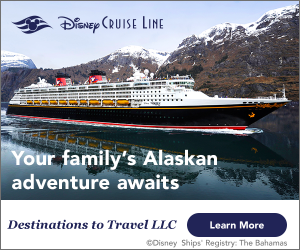 It is widely considered to be the first legitimately family oriented production on Broadway, setting the stage for future productions like The Lion King, Mary Poppins, and Newsies. 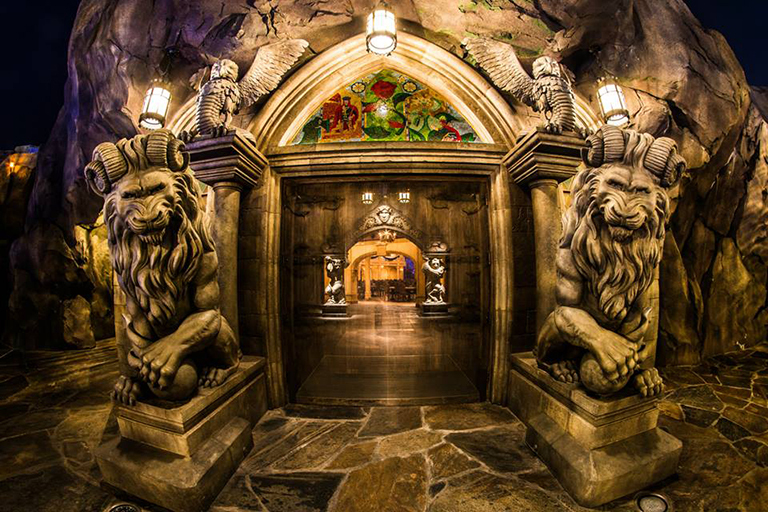 The first professional staging of Beauty and the Beast in Canada was as the Princess of Wales Theatre in Toronto. From April-July 2007, it was staged at Neptune Theatre in Halifax (becoming the longest run in the theatre’s history) under the direction of Ron Ulrich, who would a year later come to Hamilton as Theatre Aquarius’ Artistic Director! The success of Beauty and the Beast is not limited to screen and stage. Toys, games, video games, books, clothes, costumes, and houseware, for both children and adults are popular. There have been 2 direct to video sequels. 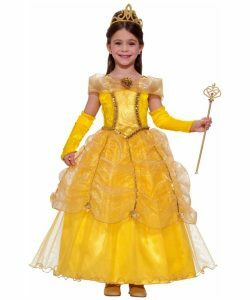 A live action television series called Sing Me A Story with Belle aired from 1995-1999, and the characters of Belle and the Beast have been reinterpreted in the popular ABC show Once Upon a Time as Belle and Rumplestiltskin. 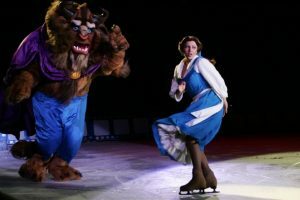 For several years, Disney On Ice performed a full-length production of Beauty and the Beast. 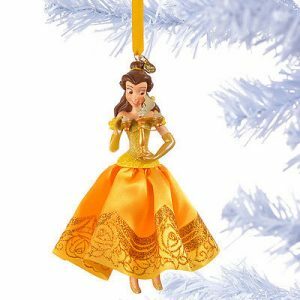 Belle is one Disney’s most popular characters. She is the fifth official Disney Princess, the first dark haired heroine since Snow White, the oldest at 20 yeas of age, the only brunette Disney Princess, and also the only one to have hazel eyes. 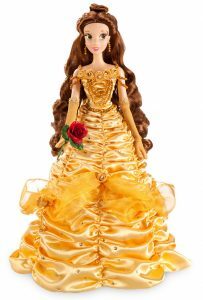 Belle is often regarded as Disney’s feminist Princess, associated with strength, women’s rights, and independence. While there are critics who disagree and point to concerns about Stockholm Syndrome, her popularity as a role model for young girls persists. Her popularity has been attributed to her appeal as an educated, active heroine – as opposed to passive female leads like Princess Aurora. Her love of books was inspiring to a generation of young girls in the 1990’s. 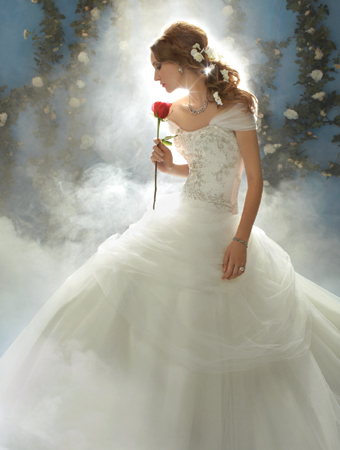 Now that they are maturing to adulthood, many are incorporating trendy elements to their weddings and homes, inspired by Beauty and the Beast. 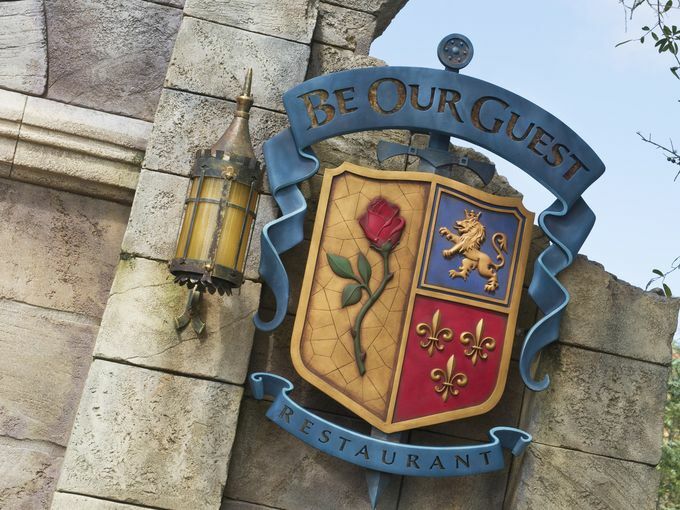 Beauty and the Beast has global popularity and that extends to Disney’s theme park resorts in California, Florida, France, Tokyo, Hong Kong, and Shanghai, where it has been incorporated into attractions, shows, parades, dining experiences, character meet and greets, and souvenirs. In Magic Kingdom at Walt Disney World, a new expansion to Fantasyland opened in 2012 which includes Belle’s cottage and the Enchanted Tales with Belle interactive show, the Beast’s Castle with the highly in-demand Be Our Guest restaurant where guests can feast on The Grey Stuff, and Belle’s Village which is home to Bonjour! Village Gifts and Gaston’s Tavern. The background music for this mini-land is the instrumental score to the Beauty and the Beast musical. Tokyo Disneyland is in the process of adding a similar land. The Beast was designed to have the head and horns of a bison, the arms and body of a bear, the ears of a dear, the eyebrows of a gorilla, the jaws and mane of a lion, the tusks of a boar, and the tail of a wolf, and his real name is Prince Adam. The Wardrobe wasn’t given the name of Madame de la Grande Bouche until the musical production. The Featherduster had no proper name in the original film, but subsequent media she has been given different names: Babette, Fifi, and Plumette. 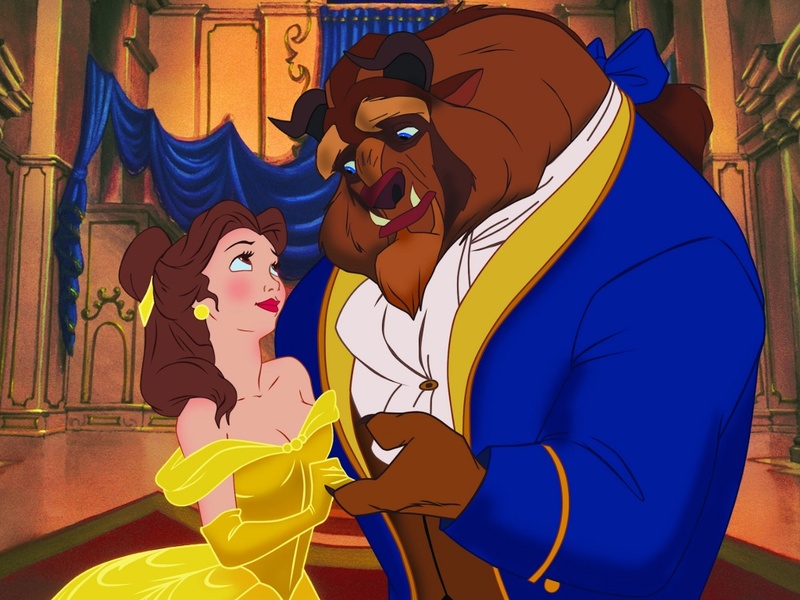 Classic literature tropes including the damsel in distress, the noble savage, and shapeshifting are key to Disney’s version of Beauty and the Beast. For the Chinese release, Jackie Chan was chosen to re-dub the Beast’s lines – and songs! 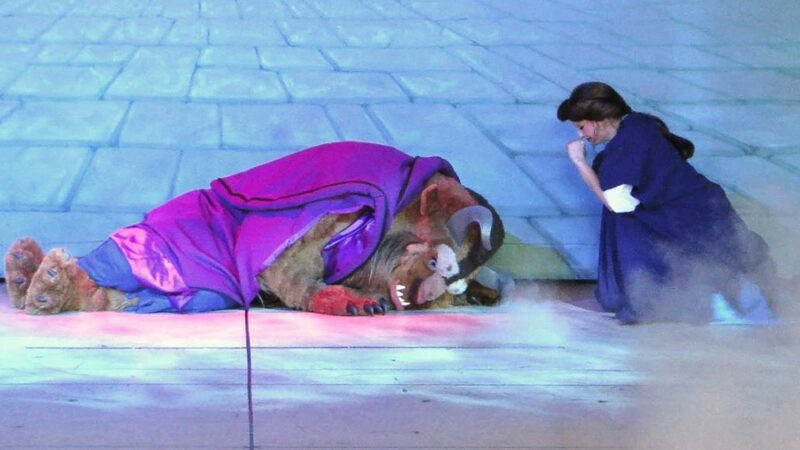 The ballad Beauty and the Beast was originally planned to be a rock and roll song. Angela Lansbury was not confident in her ability to sing Beauty and the Beast. She agreed to try one take – and nailed it, reducing the production staff to tears with her performance.